Who knew one could crame that many yummy words in one single book title? Look: handmade, bags, natural, fabrics – isn’t it all a girl would dream of? Anyway that’s what went on in my brain when Tuttle Publishing asked if I wanted to review the book. I said something along the lines of: “Are you kidding me? Of course I would!” Or so. The bottom line is: this book didn’t disappoint, au contraire. 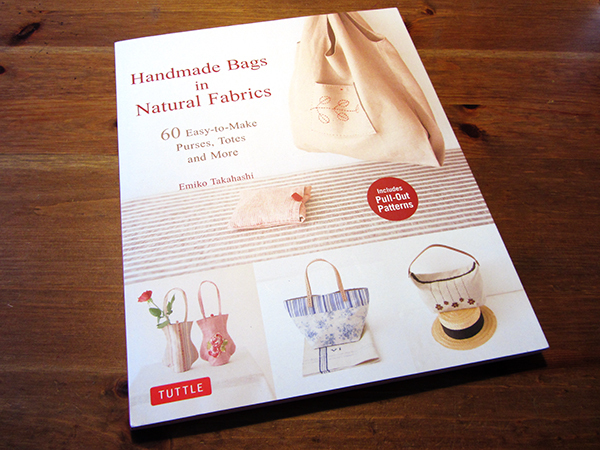 Emiko Takahashi has put together a lovely collection of totes and purses in the newly published book “Handmade Bags in Natural Fabrics: Over 25 Easy-to-Make Purses, Totes and More “. What strikes first is the soft rustic-modern look and feel of the 25 sewing projects offered here. We’re talking about beige, soft greys, vintage blues, powdery pinks, pastel yellows. There is an old French cottage atmosphere in the pictures, with the use of worn out pieces of furnitures or traditional French linen as photo props. And this is all very poetic and comforting, a great incentive to get a closer look at the book. Projects are sorted into three categories: shopping bags, everyday bags, fashion bags. The shopping bags are meant to house your grocery shopping and are therefore very roomy. There are some clever pieces of design that are worth looking into: the two way bags (2 sets of handles), the checkout basket bag (used to line your shopping basket when shopping) or the eco bag (folding down extra roomy tote). The everyday bags series features some very easy projects, that are really a good idea for the beginner: the shoulder bag or the flat bag are simple to make but can still look super good with a creative choice of fabric. Good idea: the instructions to make the flat bag and the fancy purse are detailed in two pictures rich lessons at the beginning of the instruction part of the book. Now the fashion bags are truly inspiring. With all these lace trimmings, clasp frames and creative embellishments they are a real treat to the eye. Now you know this book has really pretty projects. But what about the making part? The average level of project is easy to medium. 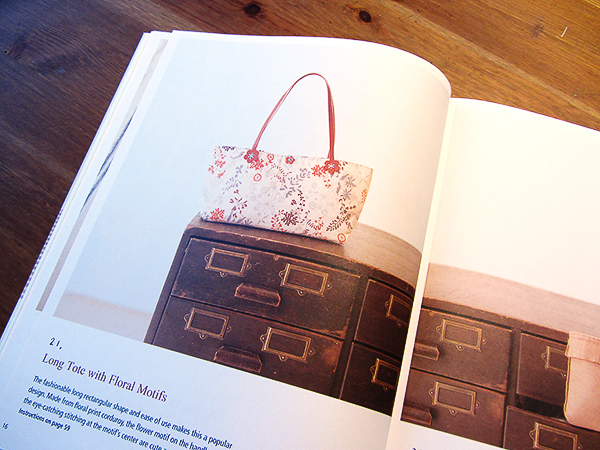 This book is not about complicated designs. It is about the joy of hand sewing simple projects. 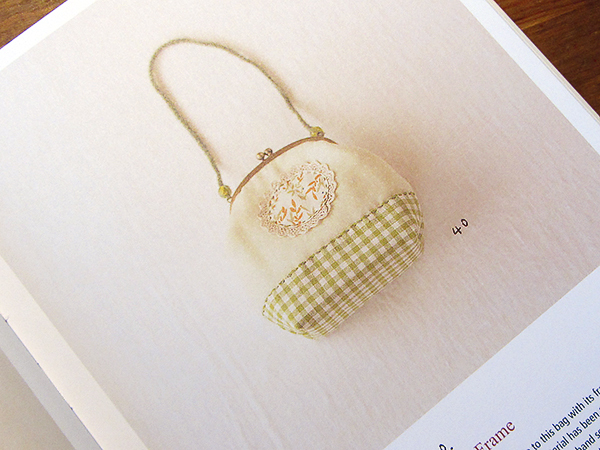 Because the author designed this book for hand sewing first. Surely enough, you can still machine stitch them. But if you go down the hand sewing road you’ll get a chance to get caught in the happy and quiet meditation that invariably comes upon me when hand stitching. 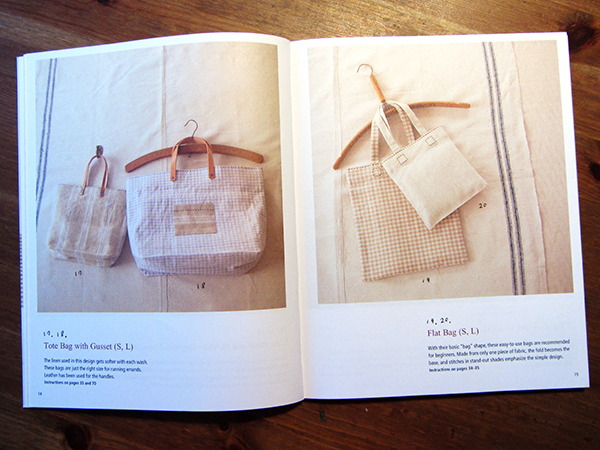 Behind this book is the idea that lovely bags don’t have to be complicated, a wise choice of fabric and trimmings goes a long way. Instructions are based on clear drawings and each step of the construction is detailed. However not all actions required are explained and it can take a bit of guessing. That’s why if you’re a beginner I would recommend to start with the two detailed lessons mentioned above (the flat bag and the fancy purse). Just so you know what it takes to make a bag and then you can give a go to other more complex projects. 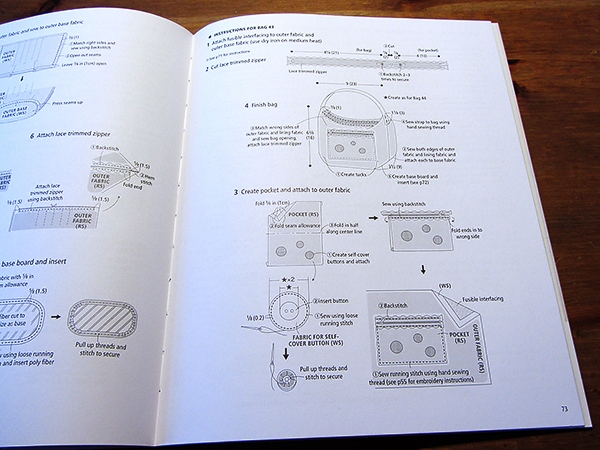 Special bonus points for the focus on interfacing: the author details all the types used in the book and how they work (interfacing can be such a daunting material!). To sum it up, I definitely recommend this book. With the C******* word coming up very fast, you could pick a couple of lovely and quick projects to give to friends and family. And as far as I am concerned I’ll pack a bag project when I go home for a family Christmas during which I’ll probably need some alone meditation time. This is not a sponsored post. I didn’t buy the book but remember I only review interesting stuff and always tell what I think about any product I review. However I am part of the Amazon Associates Programme. If one of my readers clicks on the amazon links (first link of the post), I would earn a percentage of their purchases with Amazon. Next Post How to create a graphic post for your Facebook page?